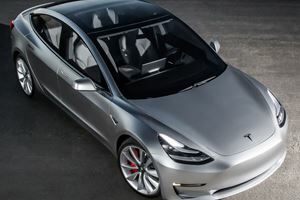 The follow-up SUV act to the Tesla Model S sedan, the Tesla Model X is amongst one of the most unique and distinctive cars in this segment. Base models get sufficient thrust and over 237 miles of range from a 75-kilowatt electric motor setup, with higher-tier models endowed with another 50 miles or so of range and extra oomph from a more potent 100-kilowatt setup. Interior build quality and ergonomics are also worthy of note, and the lack of any engine noise aids a cabin ambience that’s already very quiet thanks to all the noise insulation. Passengers should find the five-seater Tesla Model X to be roomy too, though seven-seater versions can be a bit cramped – especially in the back. Being such a noteworthy departure from industry norms with regards to powertrains and exterior styling, it’s not surprising the Tesla Model X has a pretty novel interior. 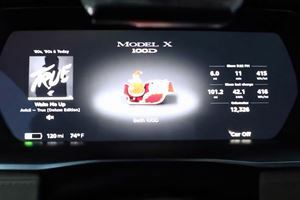 Barely any buttons are present in the cabin, with a vast majority of the car’s controls being operated via capacitive inputs on the steering wheel or the gargantuan, easy-to-use and tablet-esque touchscreen on the center console. The remaining of the cabin is more conventional, but no less satisfactory: build quality is top notch, ergonomics are sound and there’s good amounts of space for people on five-seater models. The rear seats on seven-seater models are quite restrictive, however, and the Model X’s otherwise-impressive max cargo capacity of 88.1 cubic feet is split across the front and rear trunks. With no intrusive engine noise to speak of, the Tesla Model X has one of the quietest cabins of any car on sale when you’re travelling at speed, with only hints of electric motor hum, wind noise whistle and tire roar at highway cruising speeds permeating a whisper silent interior. Better still, the Tesla Model X is pretty handy on twisty roads too, with a combination of light steering and the battery pack placement keeping the center of gravity low making the Tesla feel rather agile for a car of this size. The Tesla Model X isn’t without fault, however: the ride can be a little bit bumpy over rougher road surfaces, and the view out back is rather compromised by thick pillars and the two rear seats on cars fitted with seven seats. The huge windshield means you’ll have no issues seeing where you’re going when driving forwards, though. With the power delivery of electric motors meaning almost instant thrust from the moment you press the gas pedal, even the entry-level 75-kilowatt version should offer more than enough propulsive power for day-to-day needs. If you must need extra oomph, then there are two 100-kilowatt versions to choose from – with the latter claiming accelerative pace to rival many a high-performance sports car. Regardless of which version is chosen, all the powertrains are whisper silent bar the distant electric motor hum, and the 75kw’s maximum range of 237 miles should alleviate range anxiety concerns. The ranges of the 100kw versions are superior by approximately another 50 miles, but the lofty MSRP increases mean they aren’t worth going for if you don’t go on long highway journeys. The Tesla Model X is quite the forward-thinking car with regards to the powertrain, so it’s rather appropriate that the equipment specs are also worthy of note. 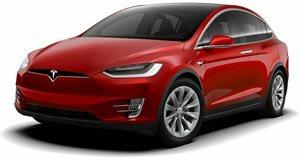 Whilst higher-tier models aren’t available with that many items over the base car, every Tesla Model X will come with heated and power-adjustable front seats, leather upholstery, autonomous emergency braking, a unique ‘Falcon Door’ rear door arrangement and navigation with real-time traffic alert as standard – on top of any additions that Tesla includes in software updates for the car. No crash test results are available for the Model X yet, but the array of safety gear should ensure the Tesla will fare well in an accident. An advanced ‘AutoPilot’ self-driving system can be specified, though it’s advised you use it as an assist rather than a full-time tool. It won’t be for everybody, but there’s no denying the Tesla Model X is a pretty impressive piece of kit. Where it loses ground to more conventionally-propelled rivals, it makes up with the packaging and powertrain advantages that result from being a pure electric vehicle. If you’re willing to take the EV plunge, there’s a rather well-rounded vehicle to be found in the Tesla Model X. 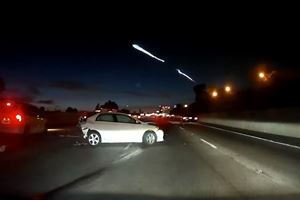 If only this driver had Tesla's emergency braking. Add this to the massive list of easter eggs from Tesla. Or could it have been a scam?